It wouldn’t be fair to assume that Big Local is always straightforward and easy. As much as £1m can make a huge difference to what an area can achieve, it can also make huge demands on those giving time and energy to make it work. Since I visited them, Barnfield Big Local has had to deal with challenges and conflict. Wargrave Big Local has had to work hard to reconcile very different views on the extent to which resources should be spent on celebrating, as much as moving on from their heritage. 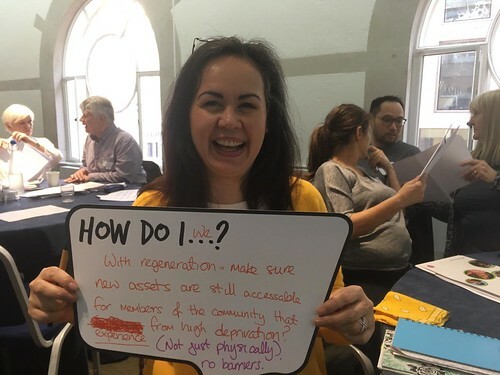 But part of what makes Big Local special is that there is the time and patience to accept that this is an element of any community’s life, and work with them to find positive ways forward. A couple of weeks ago, I travelled up to the Wirral to present ‘Heart of the Community’ awards to some fantastic local heroes. It was the second time in a year I’d been to visit Beechwood, Ballantyne and Bidston Village Big Local, a partnership that has achieved huge amounts in the last twelve months. When I arrived Linda Finn, co-chair of the partnership, was busy in the kitchen of the still newly-acquired community centre preparing soup, curry and rice to feed the expected crowds. In the main hall, worker Karl Rooney handed me a script and timetable planned with military precision. "A fitting end to a year which, for me, had relentlessly highlighted the incredible potential of local people to make a difference to the places they live." Both were justly proud of what had been achieved since my last visit in March 2017. The community centre, which had previously been locked up and unused now felt vibrant. It wasn’t just fresh paint – a new soft play area had been installed with Big Local funding, helping to bring local mums together in the new community café. Elsewhere on the estate, the hairdresser set up with Big Local funds to bring new life to the previously deserted estate shopping parade was doing well and the Community Larder continued to provide a vital service to local residents. Not to mention the entire estate had won Best Village in this year's Northwest In Bloom – an unprecedented achievement for a social housing estate perched close to the M53 on the outskirts of Birkenhead. As we approached the start of the ceremony there were some nerves. Although they’d had a major coup in securing local sporting hero, WBC International and Commonwealth Lightweight Champion Sean ‘Masher’ Dodd as the special guest at the awards, not all the seats were full. But then, as the lights dimmed, a surge through the doors saw the venue rammed to honour the people who really made a difference to their local area. From brave young carers to tireless organisers to incredible volunteers, the evening was a celebration of the best of the community. A fitting end to a year which, for me, had relentlessly highlighted the incredible potential of local people to make a difference to the places they live. Over the last year, I’ve been privileged to be allowed to share in a small way some of the astonishing stories and amazing achievements of local people, brought together by the Big Local programme. Over the coming year, we’ll be aiming to share more of them, and as widely as we can.